Tishomingo State Park | Follow the Tumble Lees! We needed some fun after a grueling week, talked about here. We are so grateful the culture of the Tiffin Motorhome enterprise is so upbeat and friendly, but it was a rough week. Whatever we do, where ever we are, we do look to have fun! But we are really pretty boring people. First and foremost with us is enjoying God’s creation, from beaches, to mountains, to flowers to babies – especially our grandson and our soon to be second grandchild! We can’t wait to bring our grandsons along with us one day…. 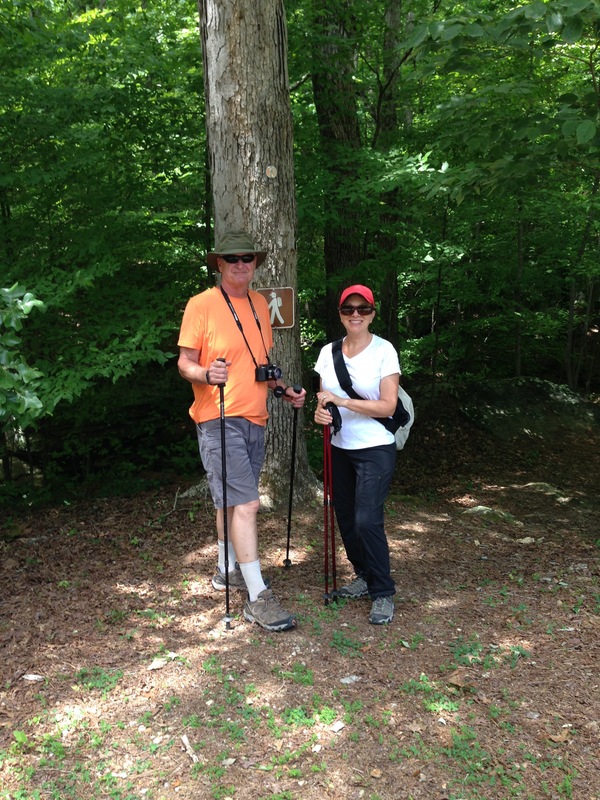 While we are traveling, our favorite activity is to go hiking, especially in the mountains, state parks or wherever there is challenging terrain and we love to take very long walks on beaches (especially Myrtle Beach or Topsail). At a minimum, we both like to walk at least two miles a day wherever we are. We also both enjoy history, so that means visiting local museums. And who doesn’t enjoy a beautiful botanical garden or any gardens? But Bill also enjoys keeping his vehicles clean and polished! So we found a few things we could do to enjoy our time in Red Bay, Alabama while we get our new, but old, motor home repaired and spruced up to suit us. HIKING: The first thing we do in a new area is search out places to hike. When we arrived here, we did a google search and discovered what appeared to be the closest place was 40 miles away. We decided when we first arrived, we didn’t have the time to drive that far. So Bill went out and walked all around town, looking for a place I could walk. I can’t walk very long on sidewalks/concrete. He saw alot and enjoyed the quaint town, but found no green spaces. 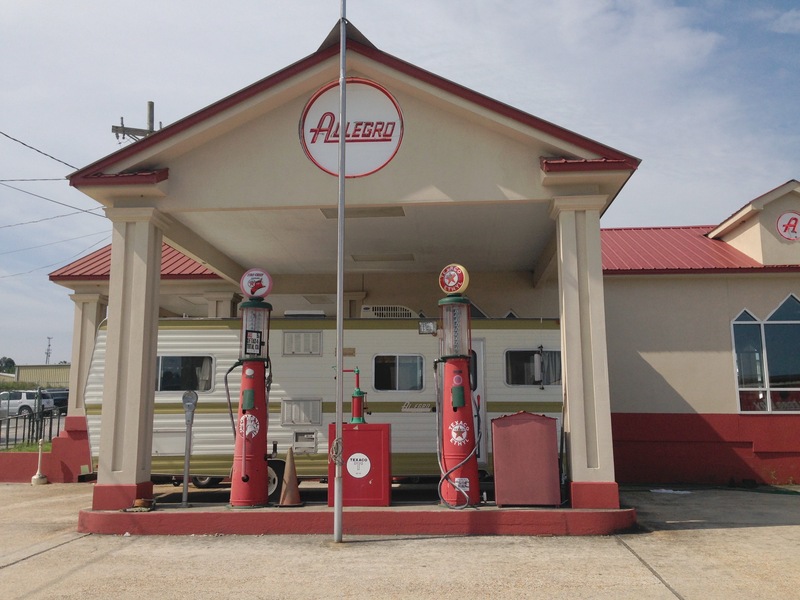 Little did we know, the Allegro Campground and Service area has plenty of asphalt and dirt roads, so we enjoyed lots of walks around the grounds and surrounding neighborhoods. I use Map My Walk app, so calculated nearly 15 miles in the short time we’ve been in Red Bay, excluding the two day hikes. We couldn’t wait to go back…so on Saturday, we headed back over. But we were delayed as we found someone to install a part for us that would be cheaper to do rather than have it installed during our servicing. So we didn’t spend as much time there as we would have liked, only hiking about three miles. It was also the hottest day of the year and we felt it! 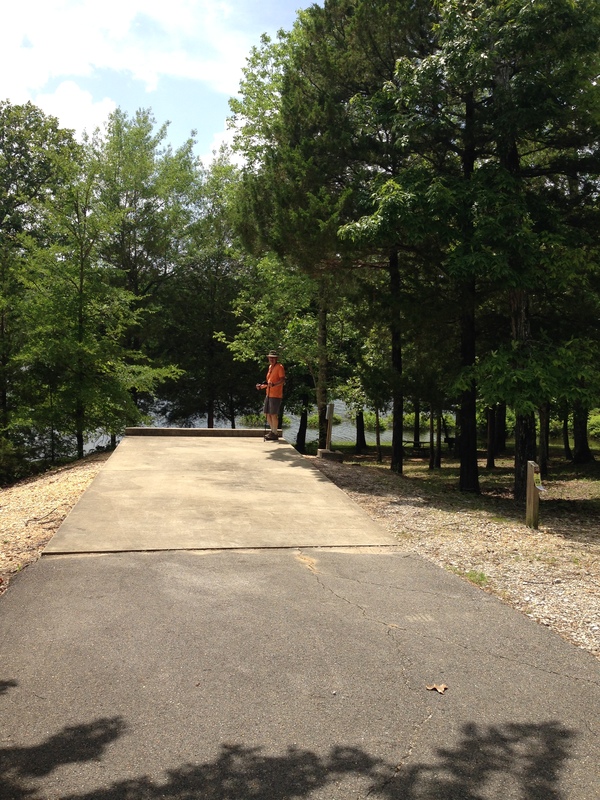 Here are a few more pictures, but click here (Flickr) to see all our pictures from the park. Our Phaeton would fit on this site! 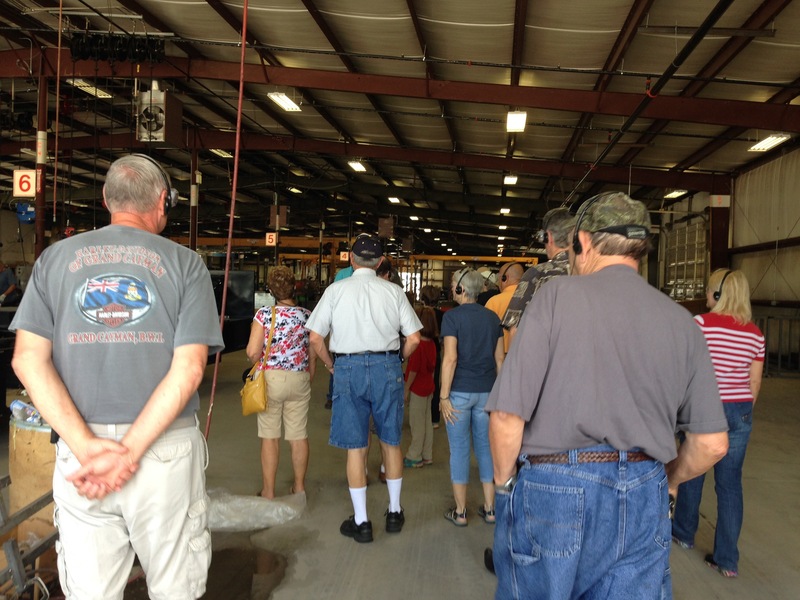 TIFFIN FACTORY TOUR: We had no expectations for this tour. But this was nothing we could have imagined! They ask you to be there by 9:15 and they start at 9:30 sharp. You are asked to sign in and put on eye protection they provide. Then you are give a headset and receiver. They have coffee and restrooms. Be prepared to stand and walk for nearly two hours! We were shown a short video as an introduction and then each of the two tour guides introduces themselves and starts with additional history. We then walked over to the factory, or at least one building to start learning how Tiffin’s are made. 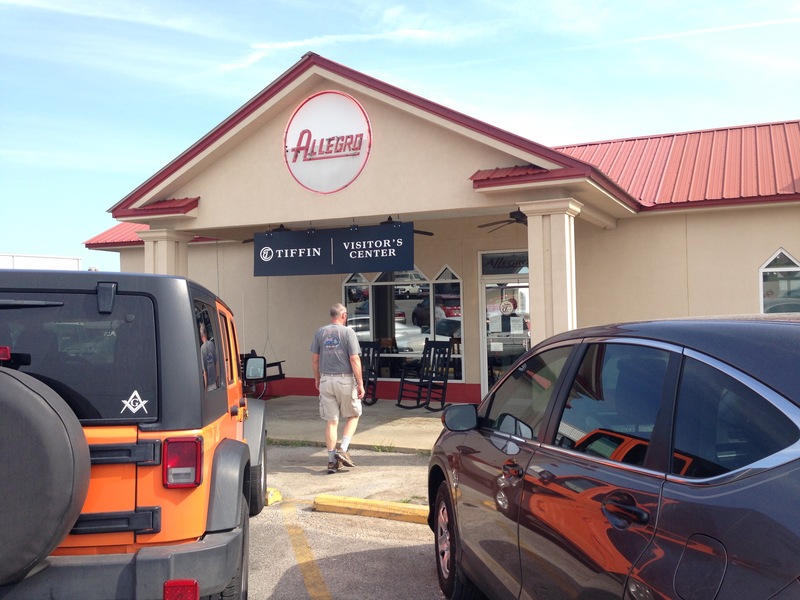 We started the tour with history: In 1941, Bob Tiffin’s father Alex started Tiffin Supply Company, a lumberyard and general merchandise store in Red Bay, Alabama. From that business start-up, two more generations of Tiffins and more than 50,000 RV owners have profited by Alex Tiffin’s strong sense of customer service. 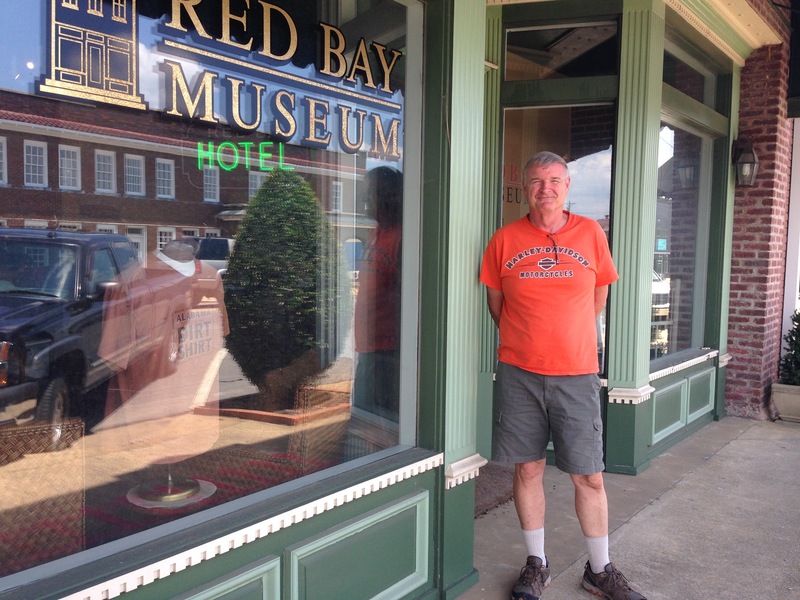 Bob joined his father at Tiffin Supply, which sold just about everything needed to build and furnish a house. In 1965, Alex Tiffin and a handful of investors bought a state-of-the-art cotton gin, when cotton was still king in Alabama and much of the South. The operations manager quit before the first bale arrived for ginning. Alex turned to his 23-year-old son Bob, who took to the cotton business, machinery and management like it was second nature. Soon he had the gin operating at ten bales an hour. He still marvels at the way the gin was engineered. Looking back years later, Bob smiles about his abiding fondness for anything mechanical — especially something that rolls. As the cotton gin became a steady contributor to the Tiffin enterprise, a new manufacturing operation came to the area. The Commodore Company opened plants to build manufactured housing and recreational vehicles. Many of their supplies were purchased from Tiffin Supply Co. The Tiffins learned more and more about their new customer and its products. After three years, the Commodore Co. called it quits, closing its doors. Always eager for a new challenge, the Tiffins purchased the facility, and Tiffin Motorhomes was born. The tour then started in what used to be the cotton warehouse. We were reminded that Bob Tiffin doesn’t like to build new when he can “recycle” a building! 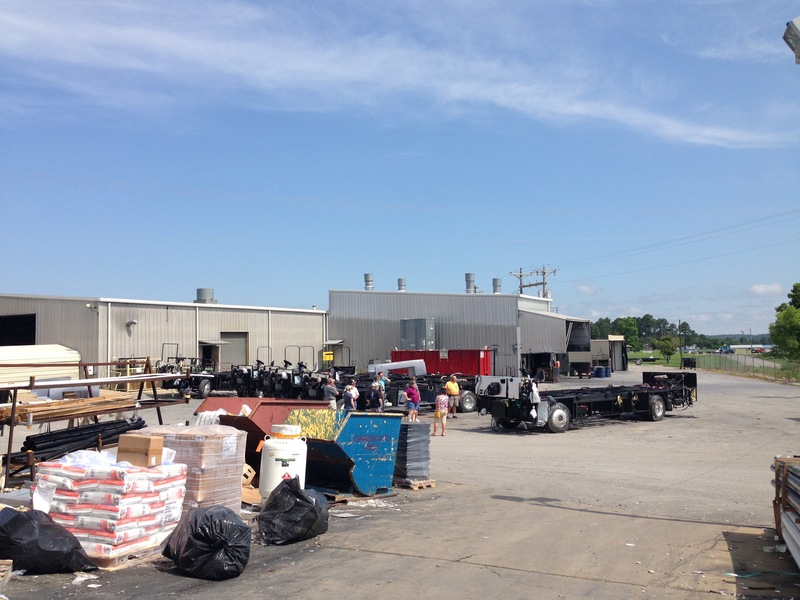 This warehouse is now where they process all the lumber and prepare it for the wood cabinets and any wooden trims! Yes, they make the cabinets by hand and we saw it in action. We didn’t need to wear face masks, but I wouldn’t recommend anyone take the tour that has breathing problems and can’t stand for nearly two hours. We then moved outside and walked over to the Chassis center. There was an outdoor presentation of the four chassis before going inside to see how they are engineered. The welding shop was near by, but we couldn’t see inside. 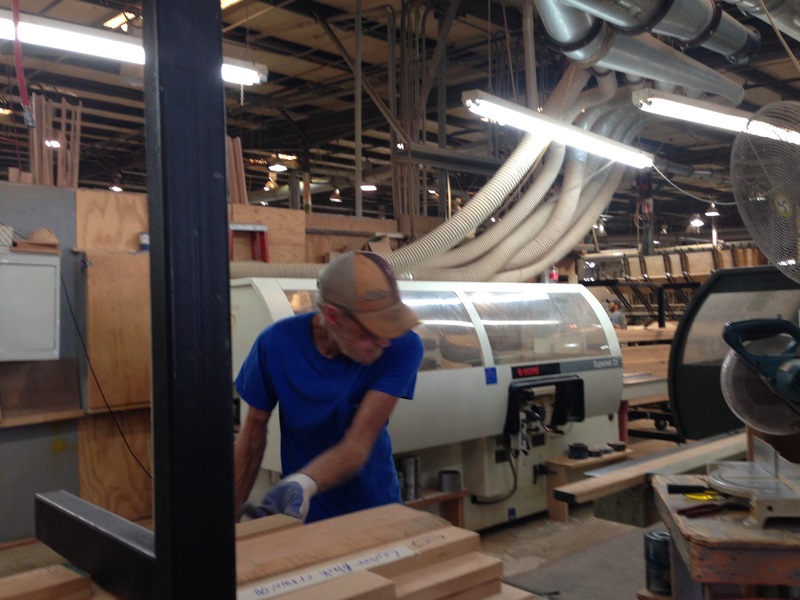 We saw how the wood shop has grown and will now expand into the Chassis center. 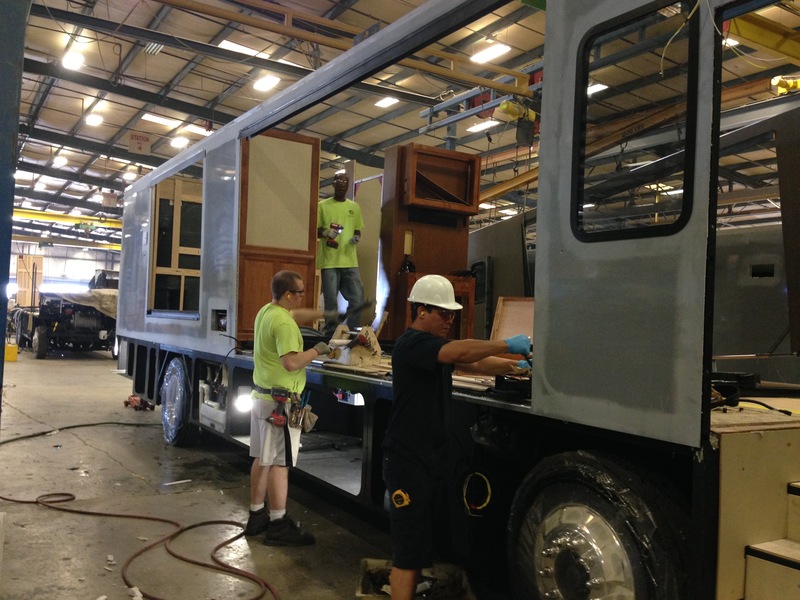 There is some transition with the chassis’ as they build some themselves and others are from Freight-liner. Outdoor chassis presentation, moving from the wood shop to the chassis shop. We were warned we would begin to wonder when we would see the motor homes actually being built, and indeed, we began to wonder. So into the actual “factory” which is not necessarily like an assembly line, but is divided into 12 separate departments. What was most interesting is that each part has a unique six digit number. If you want to watch your coach being built, those numbers will be fun to keep track of and watch. Note the head sets and standing! We are entering the shop where they begin production. Note the # 6, #5, & #4 – that’s where the parts move from site to site. From here we watched how they prepare the exterior walls. This was fascinating and using state of the art equipment. Then we saw how they prepare the countertops and then the plumbing. Next was to see how they prepare the wiring for the units. Amazingly, approximately 3 miles of wire is put into the largest units! We were then able to see how the plumbing and wiring is installed into the chassis. The next step is seeing how the tile floors are assembled and then lifted onto the chassis. The coach is now ready for the interior walls and cabinets. It was fun seeing how they move the units around, going from station to station. The next phase is to install the exterior walls, using cranes. And then the roofs are prepared, including the air conditioners and then set on top, again, using cranes. The slide-outs are assembled first, and then installed on the chassis. The front unit is also assembled with glass before being installed. Next step is to prepare the coach for paint. Currently, the actual painting is done in Belmont, Mississippi. We were all encouraged to go there to watch, but they don’t give tours. By now, the tour was over, but we were invited to go inside and look at the new models! We didn’t dare do this as we want to stay happy with our 2010! We finished the tour looking at the 1975 Allegro on display for nostalgia’s sake! It was so sad to see the yellow and green faded out shag carpet….we had it in our second house! We’re really old! 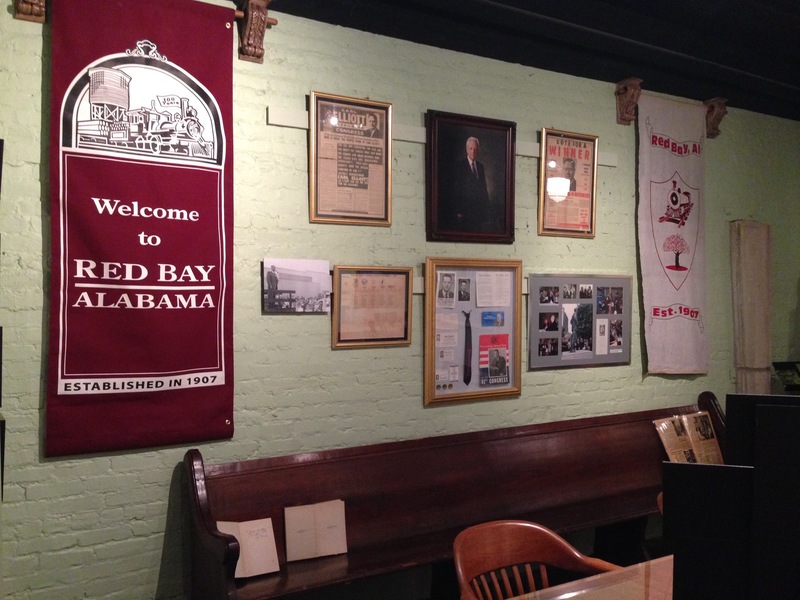 RED BAY MUSEUM: This is a very small and quaint museum. Usually when left alone, we can spend at least 2-3 hours in this size. But we were the only visitors and the tour guide wanted to accompany us through it. He said he was a “transplant” and didn’t really know the history very well. So he couldn’t answer too many questions. But was a musician so he really keyed in on all the “famous” musicians who visited the town, and especially the Tammy Wynette exhibits. While Bill has a lot of untapped musical talent, he wasn’t that interested…and I have little to no musical talents so I wasn’t interested in famous musicians for the most part. Just sayin’…. Bill hates having his picture taken, but he hates taking pictures with my iPhone even more! 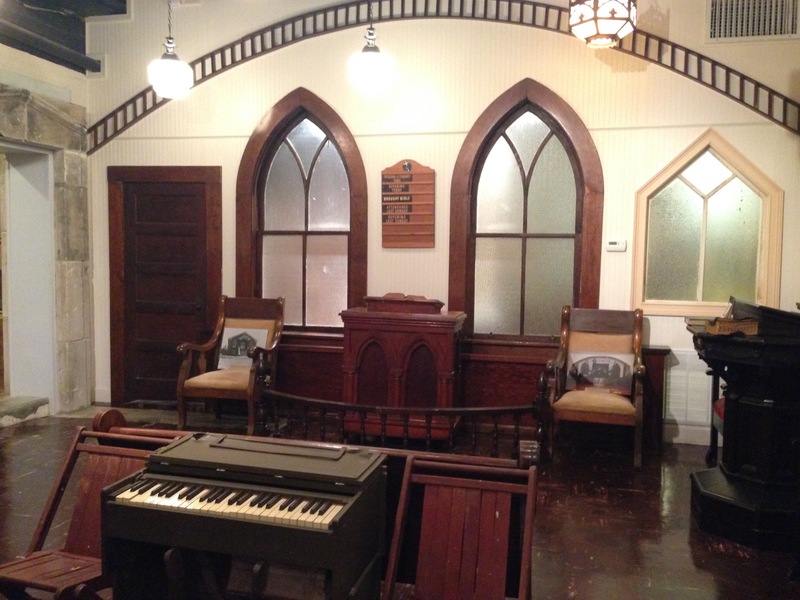 We hate seeing a “church” in a museum and pray it doesn’t come to this one day….but these were donated when the church was updated! CHURCH: We always make it a point to attend church on Sunday. And for some reason, we keep picking on the First Baptist Churches – or rather, we keep feeling the calling to attend their services. We have never been disappointed and the message always speaks to our hearts. The message this week was on God’s faithfulness and it drove home how good and kind He has been to us! And to this town. 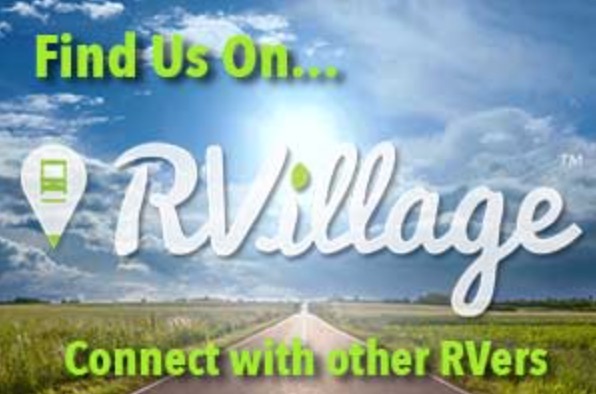 This is really a little sleepy hallow, except for this HUGE RVs that drive around town….While on our way to the Tiffin Tour, we were diverted from the route….I could see a police officer hunkered behind his vehicle, weapon drawn. I immediately thought it was those fugitives who escaped from prison in New York. But no, it was a drug addict that took 5 hostages in the local pharmacy. The pharmacist was an amazing woman, who happened to be a member of First Baptist Church (as was the owner of it). She was able to get the customer’s freed and stayed with the shotgun bearing addict. He just wanted drugs, so she complied and gave him what he wanted…and maybe a little more. Once he was out, she took the shotgun and turned it over to the police….of which there were about 50 by then! So the message really had special meaning for this congregation and town as they were all called to pray for a safe turn out! What even made this Sunday better, was that we met a couple here that needed a ride to church. Their car was in the shop. So what a blessing to get to worship with like-minded believers and get to know them and their work. They are full-timers, too. 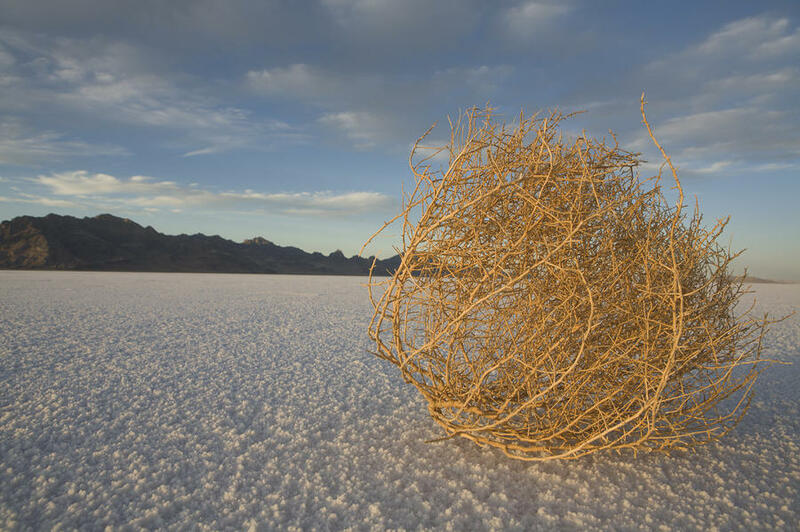 But they just sold their 5 acre farm-ette – the wife’s dream was to have chickens and grow all her own vegetables….but she just felt ready to give it up and go full time and serve the Lord in various ministries. They belong to “Campers on Mission.” Did I mention they were in their early 70s?